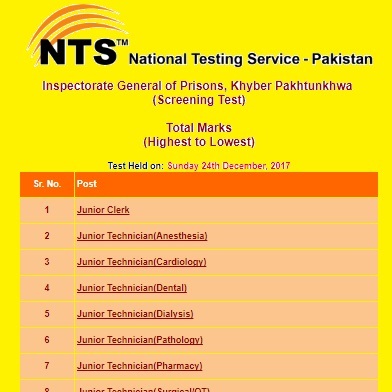 National Testing Service (NTS) has declared the Written Test Results of Vacancies in KPK Jail Khanajaat (Prison Department). Screening Test Total Marks Highest to Lowest, Test Held on Sunday 24th December, 2017. You can check your test Result on entering the required information. You should have your NTS Test Roll Number of your Computerized National Identity Card Number (CNIC). Write Your Roll Number or CNIC , If You Want to Get Your NTS Result Online.